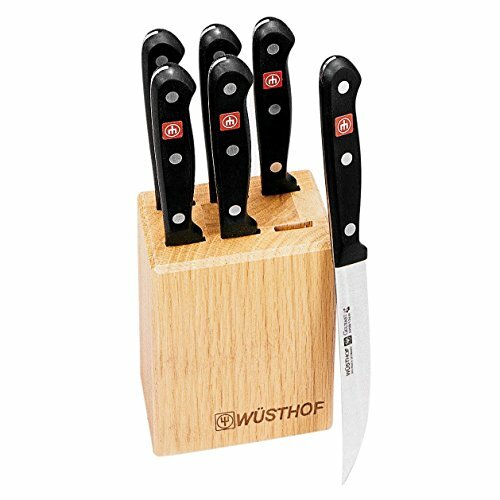 Easily perform all of your cutting, slicing, dicing and mincing tasks in the kitchen with this seven piece steak knife block set from Wusthof Gourmet. This set includes includes six steak knives and one beechwood knife block. This unique knife set features high carbon stainless steel blades for long lasting durability. The blades are forged from a single piece of tempered high carbon steel to ensure outstanding strength. The blade of each knife features Wusthof etching and the trident symbol, the steel formula and the city of origin. The blade also features Wusthof's signature Precision Edge Technology which provides extraordinary sharpness and ensures that blades retain their edge 30 percent longer. These knives are resistant to odor absorption and staining and features handles that are made from a durable synthetic material and extend all the way to the end of the full tang. The bolsters/finger guards are Wusthof's "signature" feature; it accounts for the heft, or solid balanced feel that one gets from the Wusthof knife. This set is ideal for all of your kitchen cutting tasks and includes a manufacturer's limited lifetime warranty.